Learn. Educate yourself about the issue of forced migration. Understand the magnitude of the problem by looking at the new U.N. report. Read what Pope Francis said to the World Congress for the Pastoral Care of Migrants. Familiarize yourself with how CNEWA and our local partners are ministering to refugees’ humanitarian and spiritual needs. Reach out. For refugees who’ve lost everything and who struggle to meet even the most basic needs, it can feel like the world has abandoned and forgotten them. Let them know they’re not alone. 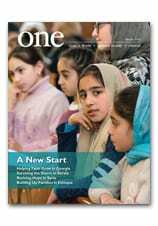 Share some of the resources that God has given you with your refugee sisters and brothers by making a gift to CNEWA. Share. Once you’ve prayed, learned and reached out to refugees, invite your friends and family to join you. You can share this blog post on Facebook or Twitter and let everyone know what you’ve done. Maybe you’ll be an inspiration to others who are looking for an opportunity to do good. Thank you for taking action on this World Refugee Day — and blessings and prayers of gratitude from all of us at CNEWA! The organizer of a 16 June protest in Detroit against federal agents’ rounding up more than 100 Iraqi-American immigrants told local media that those who were detained had no prior warning that Immigration and Customs Enforcement would be arresting them the morning of 11 June. Joined by U.S. Democratic Reps. Sander Levin and Brenda Lawrence of Michigan, members of the Chaldean Christian community gathered in front of the Patrick V. McNamara Federal Building. They held up signs, crosses and American flags, venting their frustration against federal authorities who detained their father, brothers and uncles, many of whom have been in the community for decades. Martin Manna, president of the Chaldean Chamber of Commerce, organized the demonstration. “I represent a rich cove of the Iraqi-Chaldean community, and when I called Martin Manna, I got here quickly,” Lawrence said. “Chaldeans are our friends, our neighbors. “Why did ICE decide to target and round up Iraqi-Americans? Where is the written policy?” Lawrence asked, referring to the “verbal agreement” U.S. President Donald Trump had with the Iraqi government regarding accepting deportees from the United States. Levin and five others from the Michigan delegation to the U.S. House of Representatives wrote a letter to U.S. Secretary of Homeland Security John Kelly, requesting a copy of the U.S. government’s agreement with Iraq so it can be subject to congressional oversight and to hold off on sending the detainees to Iraq until their safety can be guaranteed. “We are here on behalf of the Chaldean community, proclaiming this as not only a Chaldean issue, but an American issue,” Levin said. “We’re saying to ICE, let there be time for justice. Sec. Kelly said, ‘we’re only going after the ‘worst of the worst.’ There arrests have been made without regard to what crime has been committed, or what sentences have already been served. Father Anthony Kathawa, parochial vicar of St. Thomas Chaldean Catholic Church in West Bloomfield, said many in the parish and surrounding Chaldean parishes have called, asking for help and not receiving many answers. Father Kathawa couldn’t confirm how many of his parishioners have been detained, saying there have been many.